SYDNEY – Hundreds of NSW Falun Dafa (Falun Gong) practitioners will gather in Sydney’s Inner West on Saturday, May 6 to join a grand parade, marking 25 years since the spiritual practice was first publicly taught in China. Traditionally celebrated on or around May 13 around the world, the day celebrates the beauty of the Falun Dafa practice and its universal principles of Truthfulness Compassion and Tolerance. Since its introduction by the teacher of Falun Dafa, Mr Li Hongzhi, the practice has spread to over 80 countries and is enjoyed by more than 100 million people. It is based on the Buddha school teachings and comprises 5 gentle meditative exercises. The parade will have vibrant costumes, traditional drum groups and giant floats depicting the beauty of the practice. “We want to share with fellow Australians this wonderful practice and show its full beauty. 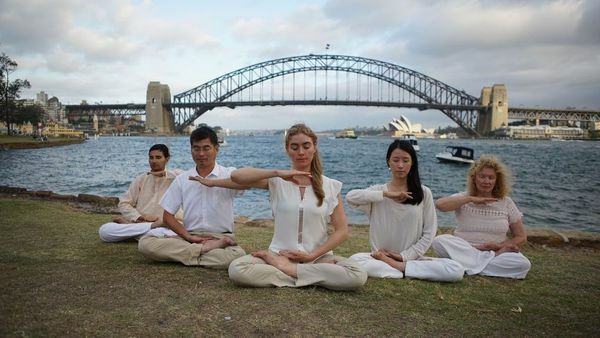 A quarter of a century of meditation and positive energy in the streets of Sydney. I think we all need a bit more Truth, Compassion and Tolerance in our world now,” says Dr Lucy Zhao, President of the Falun Dafa Association of Australia. LOCATION: Grand Parade Start: Camperdown Park, Camperdown (via Parramatta Rd) Finish: Belmore Park, Central Station.